Andy Reid had the Chiefs firing on all cylinders as the offense, defense and specials teams each came up big against the Redskins. KANSAS CITY, Mo. 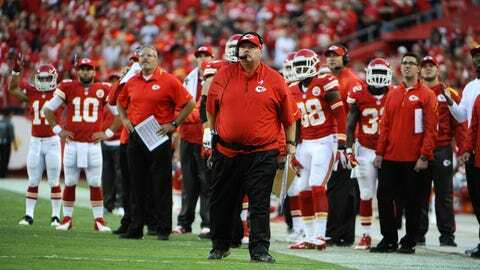 — Apparently, Chiefs coach Andy Reid wasn’t too concerned that his team might fall into an increased funk after dropping three straight games. Reid’s intuition was dead on, as evidenced by the Chiefs’ 45-10 thumping of the Washington Redskins on Sunday. Whatever problems emerged from the Chiefs’ three-game skid seemed like a distant memory after Sunday’s performance. The Chiefs dominated the Redskins in every phase. The defense came up with six sacks and held the Redskins to 257 yards and just 13 first downs. The offense scored on its first five possessions to completely demoralize Washington. And the Chiefs’ special teams came up with a punt return for a touchdown, a kick return for a touchdown and 300 total yards on returns. Tamba Hali and Tyson Jackson each had two sacks and the Chiefs’ defense dominated the Redskins’ vaunted rushing attack, holding Washington to just 65 yards on the ground. And the special teams units not only were phenomenal in execution, but in timing as well. After the Chiefs had a defensive touchdown taken off the board (correctly) after a review, Dexter McCluster took the following punt and raced 74 yards for a touchdown. Then when the Redskins showed the slightest bit of life by scoring a touchdown to pull within 31-7, Quintin Demps quickly answered with a 95-yard kickoff return for a touchdown. “In both of those cases, that just defeats your opponent’s (will),” Reid noted. The Chiefs’ offense moved with ease in the first half, mainly powered by Jamaal Charles, who finished with 151 yards rushing. “It was a great day to be an offensive linemen,” Reid said. “I mean, it’s cold, it’s snowy, you got ice and you got mud. And you’re predominantly running the ball. One of the benefits of the blowout was that Reid was able to rest some of his starters in the second half, including Charles, who is among the league leaders in touches this season. The Chiefs worked in rookie Knile Davis, who contributed 30 yards rushing and 17 receiving. Included was a 17-yard touchdown run. Reid also gave a shout-out to the many Chiefs fans who showed up for a road game.